Usually I am not too fond of Microsoft. I spent a lot of time as a student, trying to avoid using MS products. Internet Explorer was almost like foul language in the late nineties, so Netscape it was. There are still things uncomfortable regarding Microsoft software, for instance, a new windows PC is takes ages to prepare for proper use, removing malware and pieces of Windows. By the way, this can be automatized by paying a visit to sites like ninite or pcdecrapifier. Choose what to keep and what to remove, and hit the ground running. Anyway, I have cleaned up my relationship with MS, I am even buying and paying for Office and Windows these days. Windows 7 is pretty good in my opinion, miles ahead of Windows Vista. 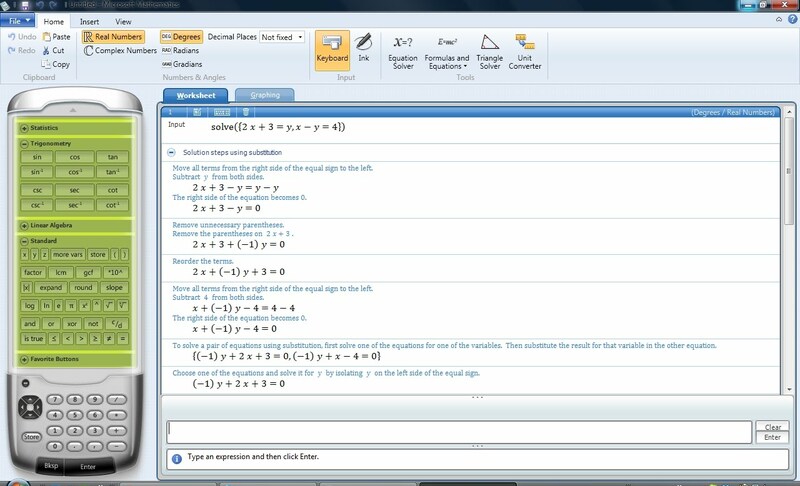 But the latest reason I have come to like MS is their mathematics software. 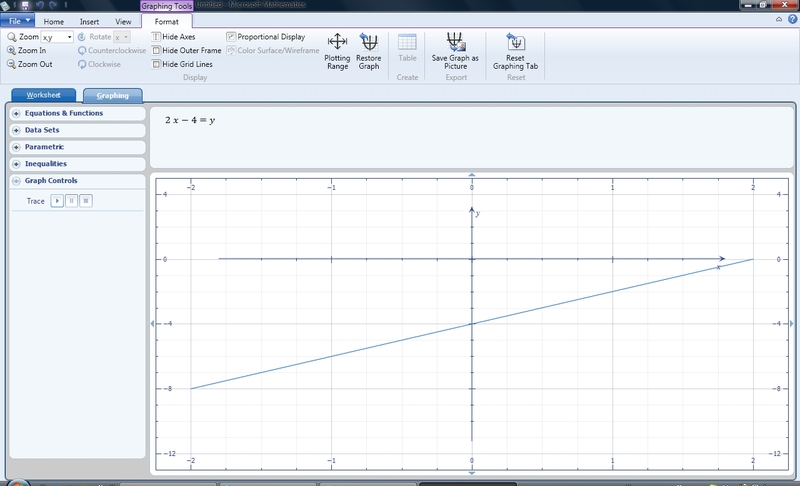 On my Norwegian blog, i wrote about Microsoft Office Math Add-in. Anders Sanne and I also wrote (a Norwegian) article on the mathematical writing on computers. Someone liked it, I guess :D. You can find it (what? You don’t understand Norwegian?) here: http://www.caspar.no/tangenten/2009/Gjovik-Sanne-409.pdf (pdf-format). This Word add-in makes it easy to make graphs and solve simple equations as well as simplify expressions. All inside of Word, which is handy. But the use is quite limited, wouldn’t it be nice to have the complete Mathematics package? 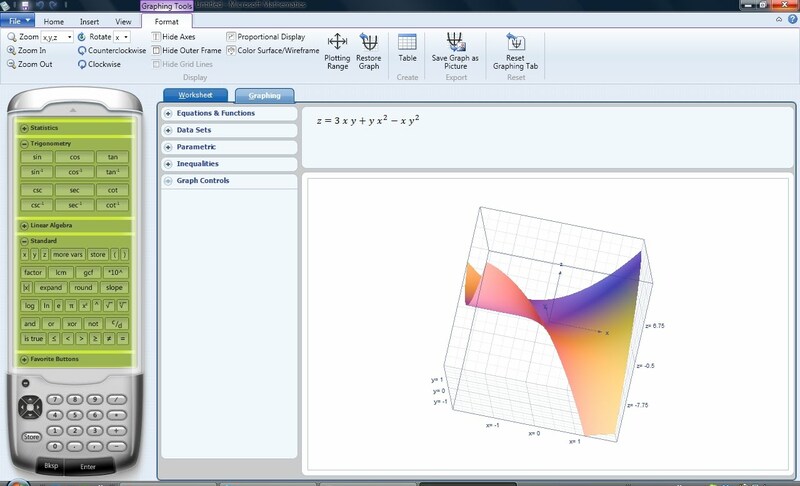 Would you know it, Microsoft decided to hand out Microsoft Mathematics 4.0 for free. You can download the whole thing here. It seems MSMath4 is less picky regarding syntax. I just typed the expression in the picture above, without consulting any manual. The insertion field behaves much like the formula editor in Word. MSMath4 formated everything right, interpreted this as a function z(x,y) and offers to plot it. Quite a few special treats are built in. Unit converter, triangle calculator and a book of formulas. I tried to enter two equations in two unnowns. MSMath4 not only calculated the answer, but showed me step-by-step solutions. You can also choose which METHOD the software should use for solving the problem. Neat. A few unfamiliar functions exist. I can choose to enter math by hand, (great for tablets or smartboards) and in the picture below my function is interpreted as mathematics instantly. If this is my software to go to remains to be seen. I get by perfectly with wxMaxima and GeoGebra. In particular, GeoGebra has a lot of teacher-specific-functions like dynamic sliders and things like that make it perfect for teaching and exploring. Perhaps wxMaxima gets eaten by GeoGebra when the latter releases the CAS+3D version. 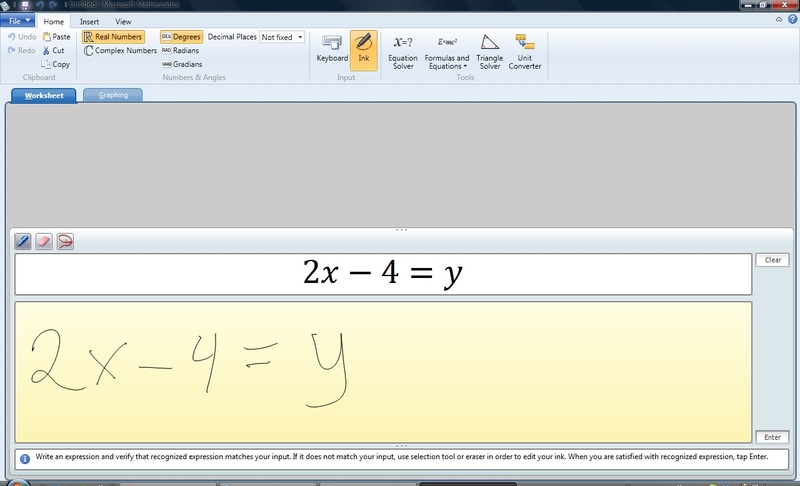 MSMath4 has a great user interface, so many will probably get to like that prior to other software. This entry was posted on Wednesday, February 16th, 2011 at 21:17 and is filed under mathematics, Software. You can follow any responses to this entry through the RSS 2.0 feed. You can leave a response, or trackback from your own site. Hello , please suggest some resources on Microsoft Mathematics 4.0. Please visit my blog http://mathematicsbhilai.blogspot.com/ , I am also a Geogebra fan. Hello Sanjay, I added your blog to my Google Reader, it looks very interesting, particularily the GeoGebra parts I just skimmed through on first view. Will look into them later. I also have a Norwegian Blog (http://mattegreier.blogspot.com), you can find some GeoGebra files there also (more than here, since WordPress don’t allow for the embeds to my knowledge). I have had a hard time finding good resources for Microsoft Mathematics 4.0, but there are some (very few) on http://www.microsoft.com/education/teachers/guides/mathematics_4.0.aspx#Equation .